The palms that our volunteers so expertly wove this year were, this year again, a paschal gift from our brothers and sisters at St Elizabeth Church on the West Side, who graciously include us in their annual palm order …. They know what palms are needed for the Egyptian palm weaving we learned all those years ago from Paul Boulos, of blessed memory. Thanks also to our weavers of crosses small and ornate, which make the Palm Sunday procession a festive and beautiful one. 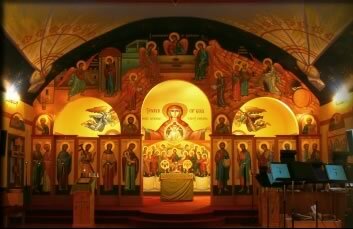 No adult education this week (PASCHA!). May 11: Meet the Franciscans! - Saturday, May 11, at 4 pm is a special adult education hour. We will be welcoming the East Side chapter of the Francsican Brothers of Peace to learn about their ministry. They will join us for Vespers and a potluck afterwards. There will probably be about 8 brothers in the group, so please bring bring some extra food to the potluck!